Vending Air Fresheners are perfect for placement in your vending machines. They are perfect for quick and easy access to your air freshener needs. Little Trees brand air fresheners are the most popular line of automotive air fresheners in the nation. 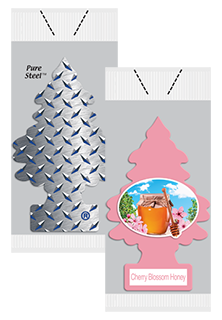 The Vending 72 Piece tree shape paper air fresheners are proven to be an efficient, high-quality solution to a common problem in all cars. Little Trees have been flying off shelves since they started being distributed back in 1952. While the first fragrances were Royal Pine, Spice, and Bouquet; the range expanded to include Caribbean Colada, Vanillaroma, New Car Scent, and of course, Black Ice. Every car wash should carry a nice variety of Little Trees in the vending machines. The Little Trees are great solid sellers that will not disappoint you or your customers, and will build your profit from your car wash operations. We offer a huge variety of all little tree air fresheners. All available in stock for immediate delivery, and at the lowest prices in the nation Guaranteed! !